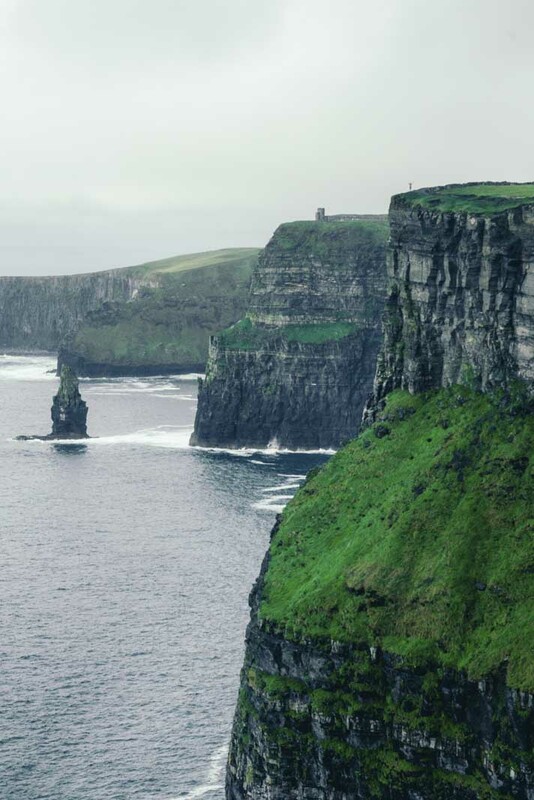 Easily one of the top destinations to visit in all of Ireland is the Cliffs of Moher. 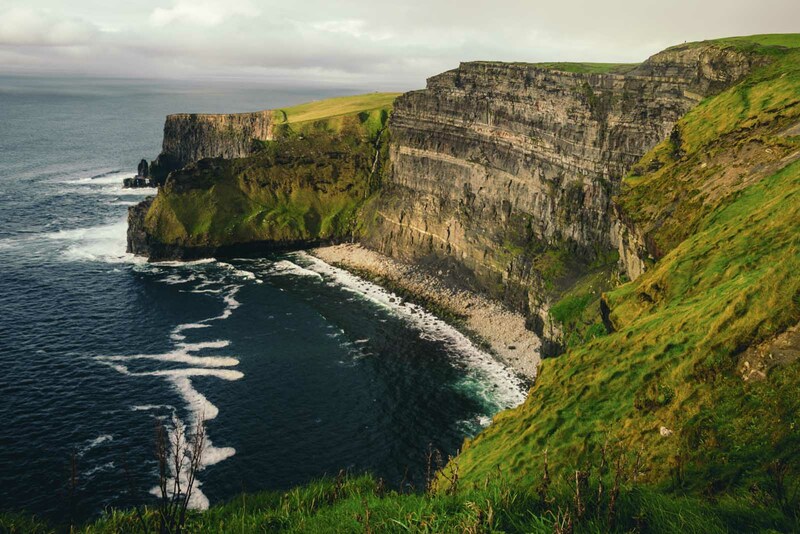 With over a 700-foot drop along the Wild Atlantic Way, this incredibly scenic coastal walk has become a must-see spot in Ireland and extremely popular with tourists. 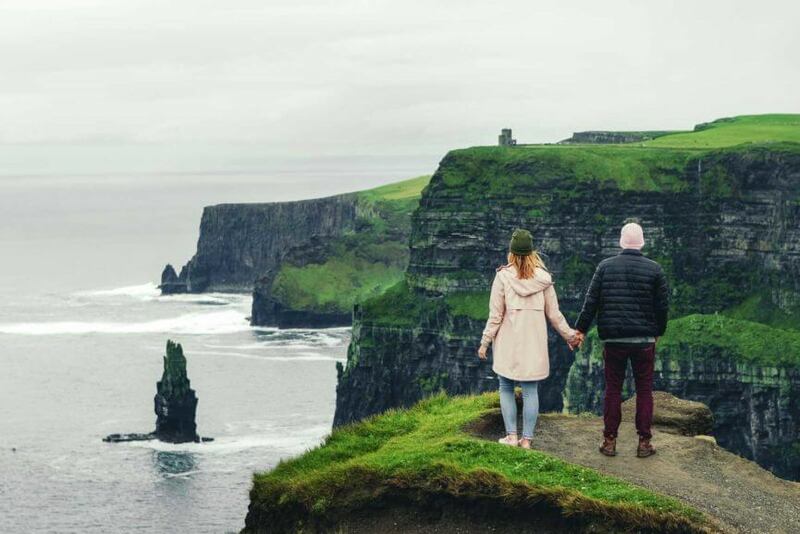 After spending 25 days in Ireland driving and seeing some of the most gorgeous scenery we decided that the Cliffs of Moher deserved to be popular for a reason. We easily spent 3 hours walking along the terrifyingly beautiful cliffside coastline and could have spent much more if the weather allowed it. What most people who visit the Cliffs of Moher do is hop on a bus from Dublin, spend 3.5 hours on a packed tour bus, rush through seeing some of the most impressive views – rain or shine, then hop back on the bus leaving without getting to explore more and spend the night in one of the most beautiful places in the country. For anyone planning a trip to Ireland or anyone wanting to witness these impressive cliffs themselves then this is the guide for you. 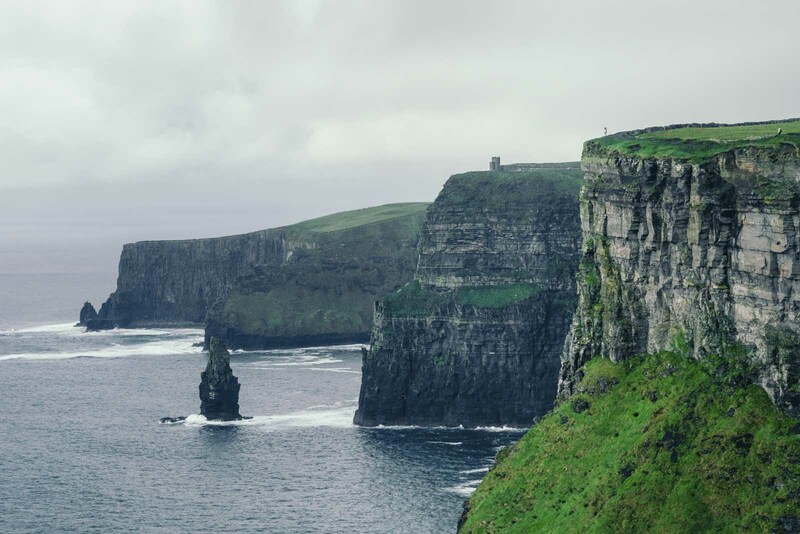 Check out our tips on the best way to see the Cliffs of Moher. Renting a car in Ireland can be daunting if you’re not used to driving on left-hand side of the road, which we weren’t. It also can be a little more costly if you do not know how to drive manual, expect about $15 extra/day. If you do know how to drive manual you can find some great deals, during our last days in the country we rented a car for four days at around $10 per day including insurance. 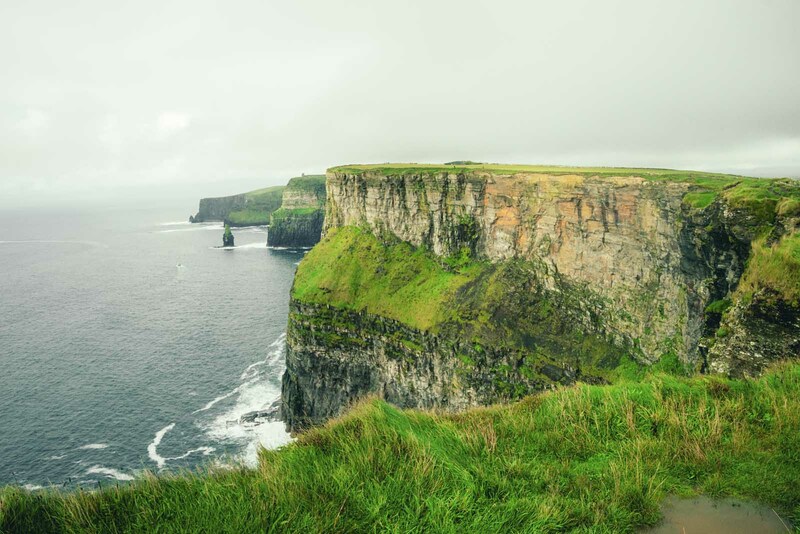 But, having your own car to travel through Ireland is totally worth it and the best way to see the scenic country including the Cliffs of Moher. Another great reason to have a car is it really gives you flexibility with the weather in Ireland. If it’s rainy and grey out you may not even be able to see the cliffs and it could be way too dangerous if there are high winds. The morning of the day we visited was impossible to visit but in the afternoon it cleared up a bit. Even if you watch the weather religiously, the weather in Ireland seems to have a mind of its own. If you’re traveling on a tour bus you do not have that flexibility. If the weather is terrible you can find a cozy pub or restaurant to camp out in nearby until it clears up enough for you to see. Parking: You can park at the main visitor center and pay a fee of 6 Euro a person, which we did and got access to the visitor center and museum. Or, if you don’t mind a bit of a walk you can park at Hag’s Head nearby for 2 Euro! *Make sure to purchase your insurance when you’re booking online in advance to avoid any problems picking up your car. Even though our Chase Sapphire Reserve credit card covers auto collision for rentals in foreign countries we had issues with Europcar at Dublin Airport accepting it and charging us an INSANE amount for having to purchase their insurance on the spot. Which most credit card companies won’t cover insurance in Ireland, but Chase does! 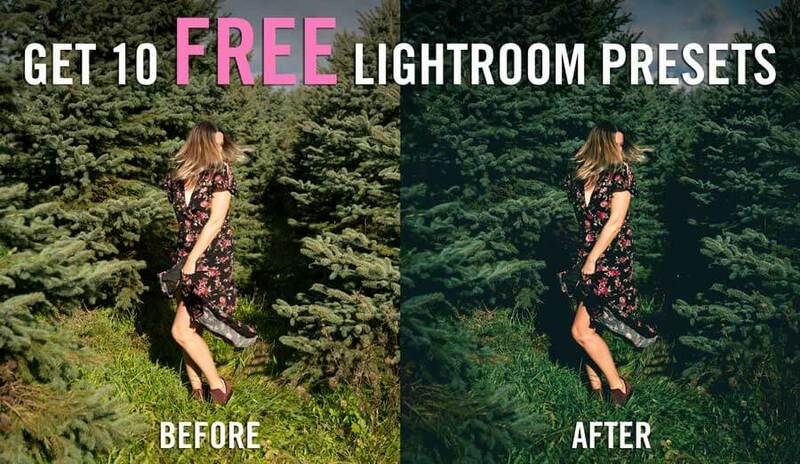 We got ripped off and there’s a much longer version of this that we won’t bore you with. We are still trying to dispute this but have been repeatedly blown off by their customer service. However, we had no issues when we rented a car for the 2nd time on our trip to Sligo by purchasing the insurance ahead of time. 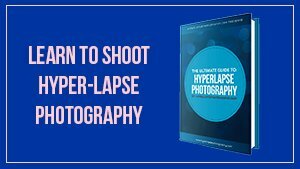 You can also avoid ALL of this by having a physical copy with proof of coverage from your credit card company if they cover insurance in Ireland, you can get this by contacting your bank/credit card in advance for them to mail it to you. 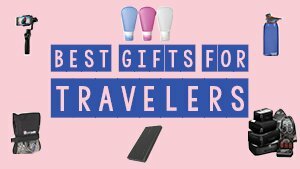 Do well before you leave for your trip! *Get a SIM card for your phone from Three Mobile. It’s 20 Euro for a month of unlimited data and perfect for navigating while driving! *Don’t be nervous, Irish drivers are friendly and you’ll get the hang of driving on the opposite side of the road! Don’t try to rush the Cliffs of Moher, as mentioned before there is a very good chance you may not have great weather and have to improvise a bit until it clears up enough for you to see the majestic views. If you’re into photography you’ll want to stick around and wander along the coastal walk since there are many different vantage points to enjoy. Regardless of photography, you can easily spend a few hours walking or an entire afternoon doing the entire 14km stretch of cliffs from Hag’s Head to Doolin. There are several cliff walk paths here. We tried to walk to Hag’s Head from the Cliffs of Moher visitor center and had to turn around after about an hour because of the bad weather coming in. We both kicked ourselves for not giving ourselves one extra day to explore the area and time to come back and explore Hag’s Head, the interesting rock formation that looks like a head jutting in the ocean at the most southern point of the Cliffs of Moher. And explore more of the cliffs towards Doolin which we got a sneak peek of and the waterfalls running into the ocean when we went for dinner in Doolin. If you’re visiting between April and May you may even be lucky to spot the breeding and nesting puffins on the rocks close to the visitor center from the binocular stand! Do not visit the Cliffs of Moher without visiting or staying at least one night in Doolin, one of County Clare’s best spots. We spent one night at Ballinalacken Castle Country House and wish we would have given ourselves at least one more night. The town of Doolin is a small and charming coastal village with great pubs known for playing local Irish music in the evenings. The area is also known for still having a population of Gaelic speaking citizens, the original Irish language before British colonization and not very common today. Doolin is also where you can view the most northern of the 14 km stretch of cliffs that make up the Cliffs of Moher. Where the pubs and shops are you can actually see a spot where there are waterfalls coming out of the cliffs into the ocean It was raining which made the falls even more impressive to see from the distance as they were raging while plummeting down in the ocean. We recommend having dinner at Gus O’Connor’s pub. We showed up around 6:30 pm and were delighted to find that there was traditional Irish music playing as well as a lively crowd. Since Doolin is a coastal city you can expect that the seafood is also delicious! Our fish n chips here were insanely delicious and if we didn’t have to check in still we would have stayed for a few pints because the scene was so fun and unlike anywhere else, we visited in Ireland. Two of the most interesting and historical sites in Doolin are the Ballinalacken Castle and Doonagore Castle ruins dating back to the 15th and early 16th centuries. 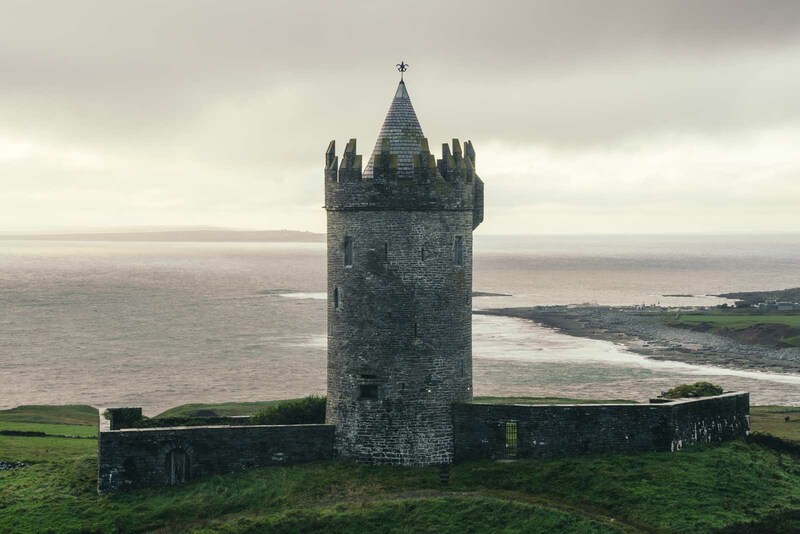 You can’t miss the Doonagore Castle if you’re headed to Doolin from the Cliffs of Moher. The castle ruins are 1km above Doolin and impressive. You can’t miss the 16th century stone tower in what seems like the middle of a small field right next to the road. You can actually just take the photo from your car window if you don’t want to get out. Ballinalacken Castle is just a few minutes drive out of town and the perfect place to stay for the evening since they have the Ballinalacken Castle Country House right next to the ruins. We stayed the night at this luxurious country home and loved it. You’re also only a few minutes away from Fanore Beach and the cove as well as the entrance to Doolin Caves. 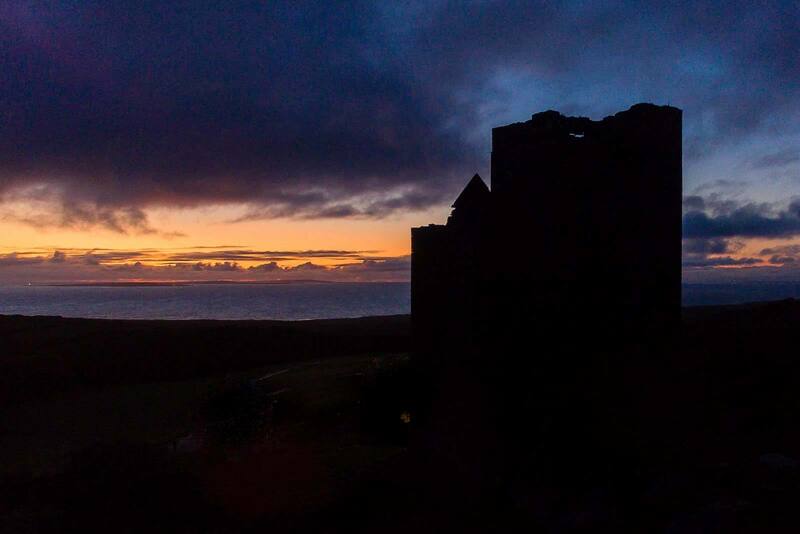 The rooms have views of the Atlantic Ocean, Connemara mountains, Aran Islands and you can take one of their daily tours to the actual castle ruins. Give yourself at least an hour or two to check out the Doolin Cave. 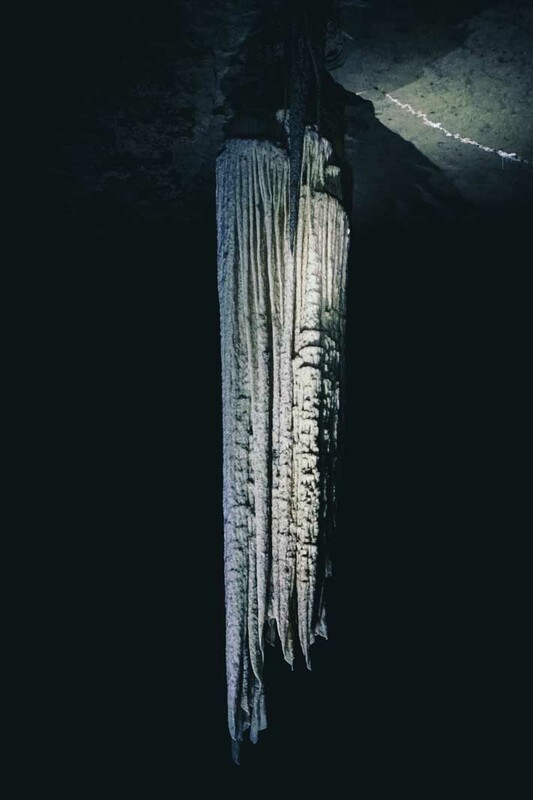 Located next door to Ballinalacken Castle, the cave is a family run tourist attraction and home to the longest free hanging stalactite in the northern hemisphere at almost 24 feet in height and weighing over 10 tons! Besides having a really amazing cave, they also have cute farm animals including goats outside of the Doolin Cave visitor center. 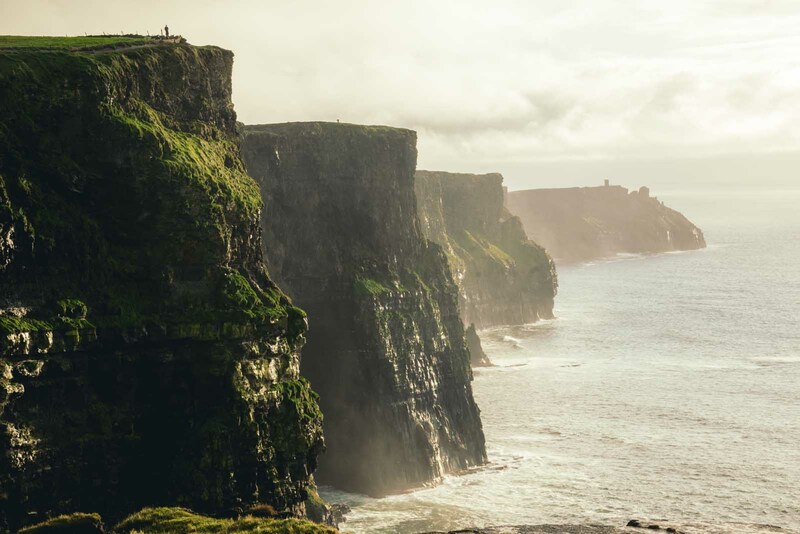 Don’t miss a chance to visit the Aran Islands while you’re visiting the Cliffs of Moher. You can catch one of the daily ferries from Doolin Port, weather permitting of course. Unless you give yourself a few extra days you may only get to pick one of the islands. 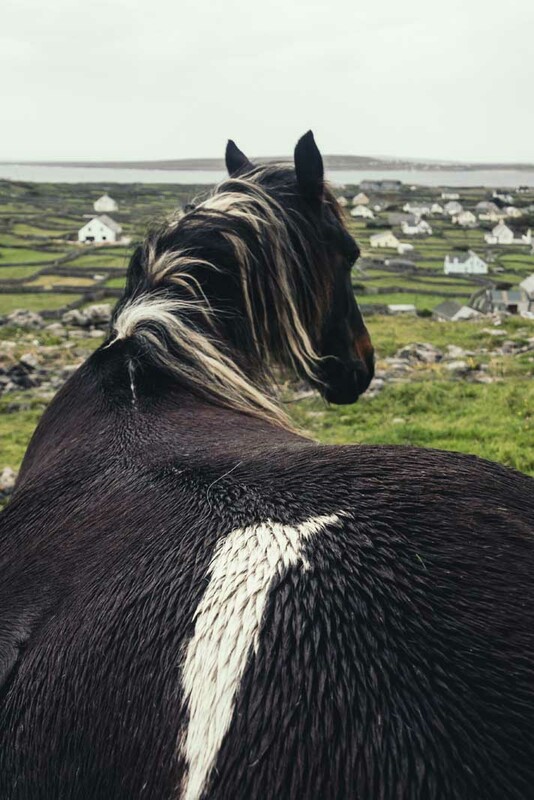 The Aran Islands are popular with visitors because this is one of the last places in the country where you can witness a traditional Irish village where Gaelic is the first spoken language and untouched by modern civilization. We visited Inisheer, the closest of the Aran Islands to Doolin and only a 15-minute ferry ride on the newest speed ferry boat. We had about 5 hours to explore the island by foot, which was a great amount of time. If you’re not into walking you can rent a bicycle to get around to the different sites quicker. We loved walking along the tiny paths full of pastures after pastures made up of rock walls. There was even a white sand beach, shipwreck, and church ruins. The most popular island to visit is Inishmore thanks to its beautiful cliffs, puffin holes, church ruins, the medieval ruins of Dun Eoghanacht fort, the black fort, and the wormhole or place where Redbull does their adrenaline rushing cliff diving competition. 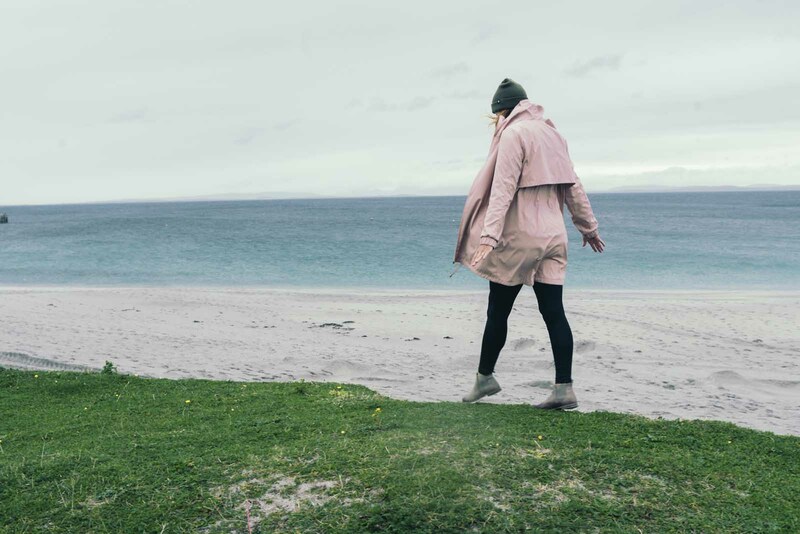 The Aran Islands are also famous for their cable knit Aran sweaters worn by fishermen which have grown in popularity and can be found in gift shops all over Ireland. If you’re lucky, you may even find a local selling homemade knitted Aran Sweaters out of their house like I did! I was so excited because I wanted an Aran sweater and had been hunting since we arrived in Ireland. I am so glad I waited until we got to the Cliffs of Moher and Aran Islands because I lucked out. See our experience and more photos of our day trip to Inisheer. 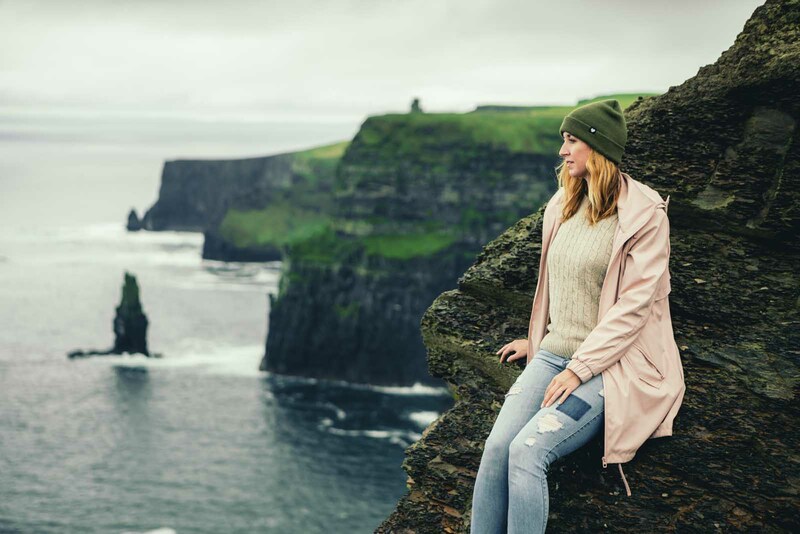 The best way to see the Cliffs of Moher is to honestly give yourself time and take it all in. From the dramatic scenery to animals grazing along the terrifyingly beautiful cliffs. There is no other place in the world like this and doing a quick day tour just won’t give you the experience you deserve. 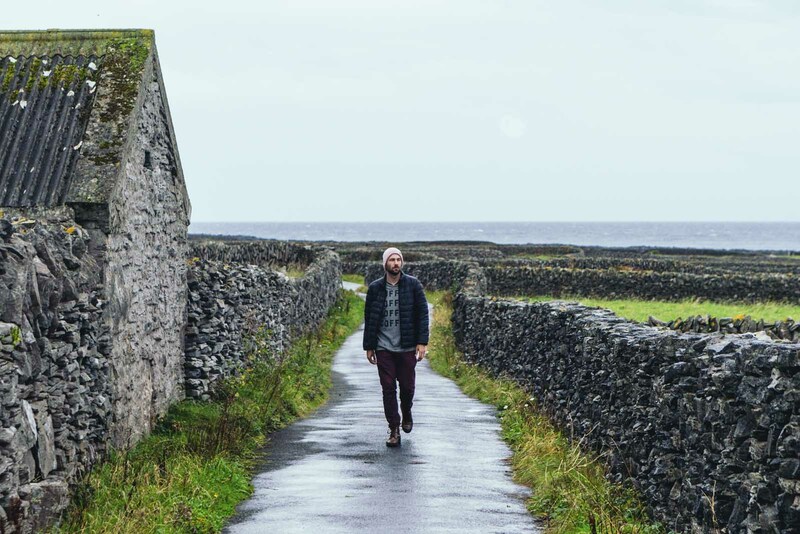 The fresh ocean air from Ireland’s Wild Atlantic Way and the feel of being somewhere completely foreign when you hang out in Doolin or the Aran Islands and hear Irish speaking locals or traditional Irish music over a pint of beer. There’s just really no other places like this. 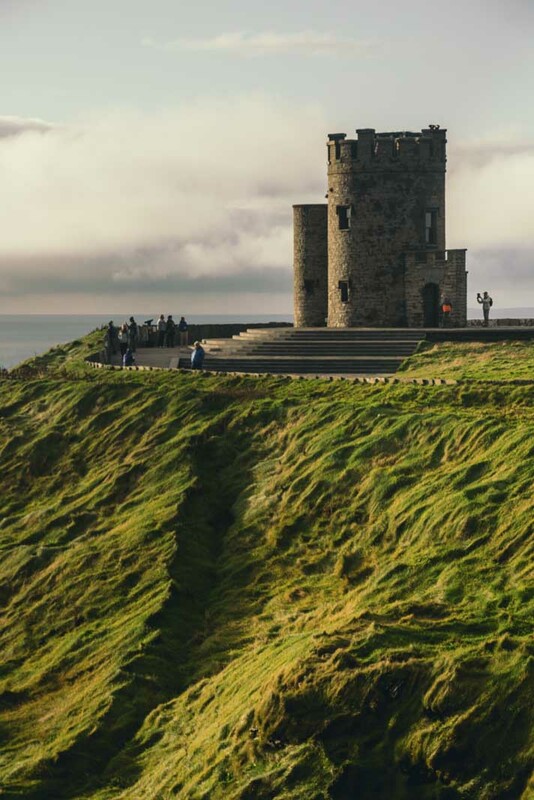 The Cliffs of Moher are also home to filming locations of huge Hollywood blockbuster movies like the 1980s hit Princess Bride and Harry Potter and the Half-Blood Prince to name a few. It’s really no wonder why films have been shot here as the scenes are out of this world. We highly urge you to stay the night in Ballinalacken Castle Country House. Not only do you have historical castle ruins just steps outside your door, but your stay here is an entire experience. They have fine dining available in the evenings or an option to just get a drink or glass of local Irish whiskey by the fireside in their main sitting room. The rooms all have incredible views, ours being of the Atlantic Ocean and others looking over the beautiful and unique mountains of Connemara. Staying here felt not only like you were in a quiet place of solitude but also the hospitality was out of this world. It’s no wonder why they have such great reviews on TripAdvisor. For more amazing cliffs check out the Loop Head Peninsula and Kilkee Ireland. 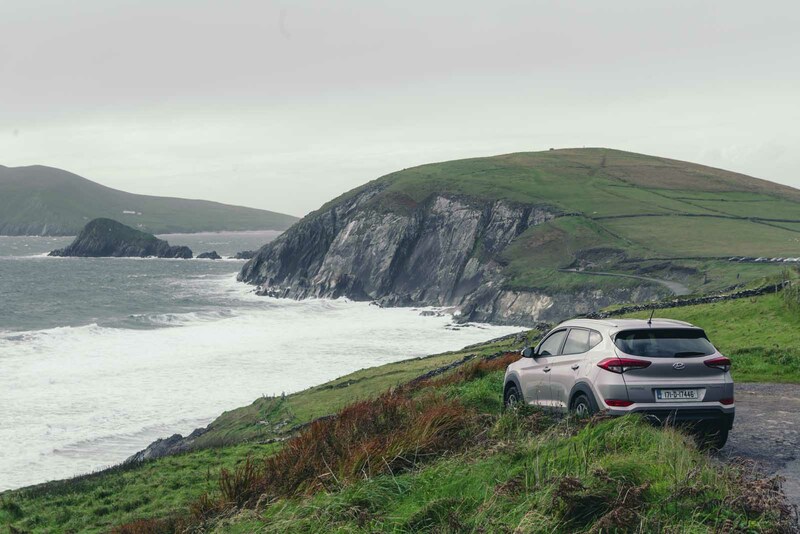 Also, for more of Ireland’s scenic Wild Atlantic Way you can check out the Dingle Peninsula and its stunning views. 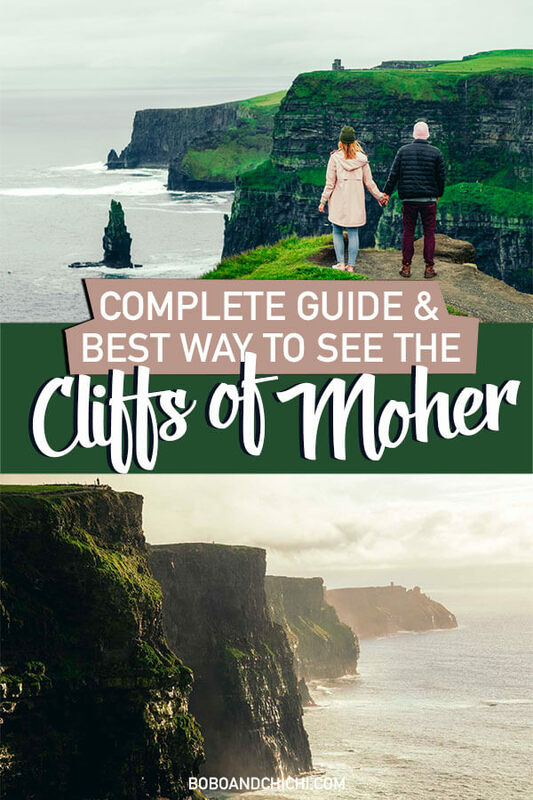 Liked this post about the best ways to see the Cliffs of Moher? 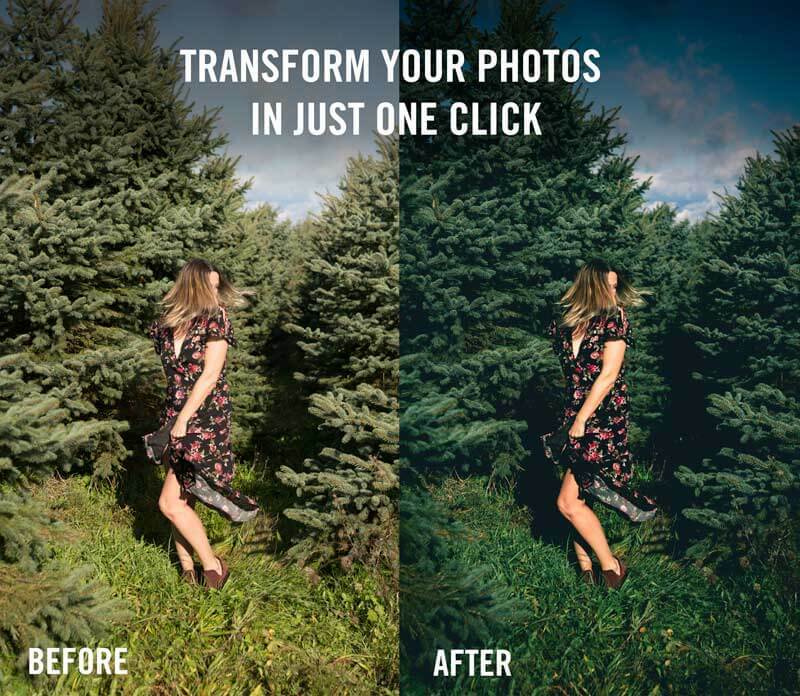 Share the love below on Pinterest.